Monday ?? We are on Poulton le Fylde Market. Please ring. Friday ?? We are on Skipton Market. Please ring. Appointments can be made outside these hours by arrangement. 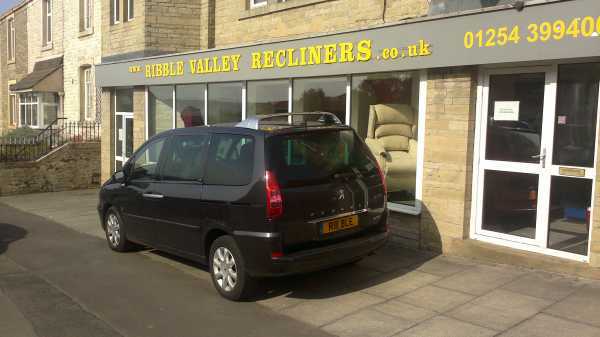 The showroom is located at 244 Whalley Road, Clayton Le Moors, Accrington. BB5 5HE. 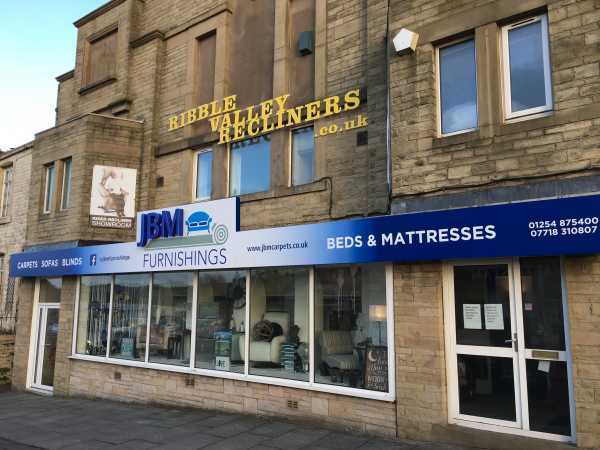 We are now located on the first floor of the building above the JBM Furnishings Showroom. 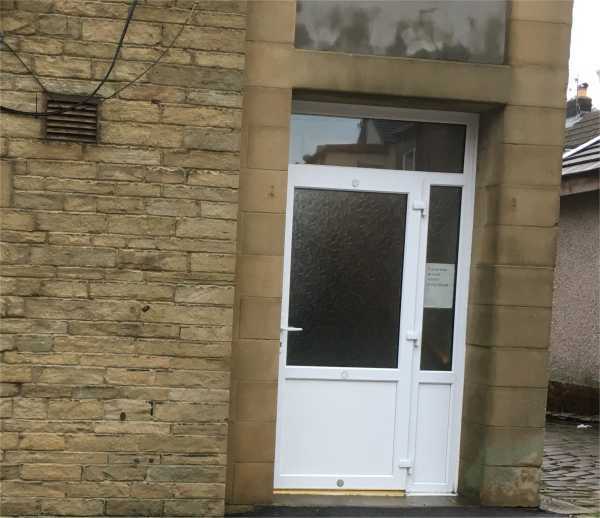 Our shop entrance is on the first floor at the side of the building on King Street at the top door. Access is via a short ramp with an accompanying handrail. The premises are 100 years old, and were originally The Empress Cinema. Very easy to find, just 1/2 a mile of the Motorway. Junction 7, M65. 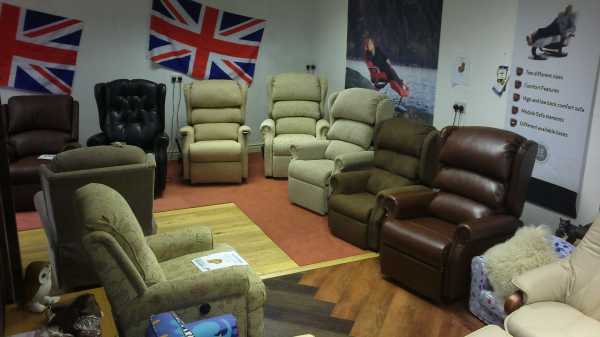 At our Ribble Valley Recliners showroom, we have on display a large range of reclining motion furniture. From single chairs, 2str sofa’s to full suites. 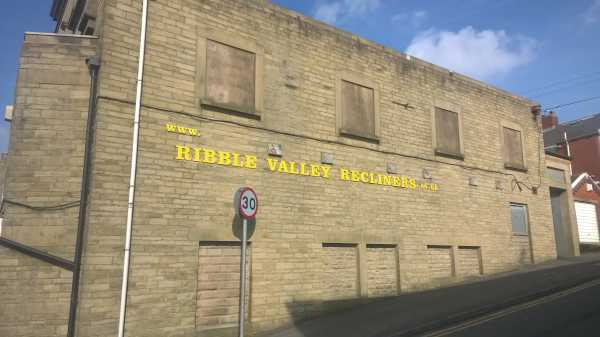 We are centrally located in Clayton Le Moors, Accrington . Within easy reach in Lancashire, Yorkshire, Manchester , Cheshire , Cumbria , North Wales , Staffordshire and Derbyshire. 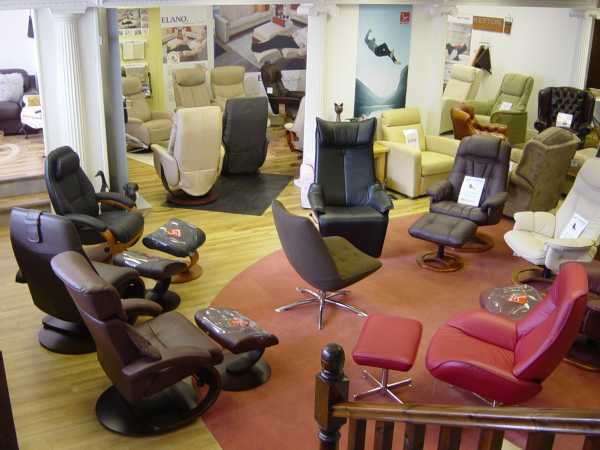 Do to our specialist nature, and superb stock of recliners on display we regularly have customers who travel from all over the UK . London, Glasgow and Edinburgh all have many happy customers who were glad they made the trip to get exactly what they wanted. We also specialize in catering for chairs with dimensions which are outside the everyday stock range. All our lift and tilt mobility riser chairs are all high quality British made. 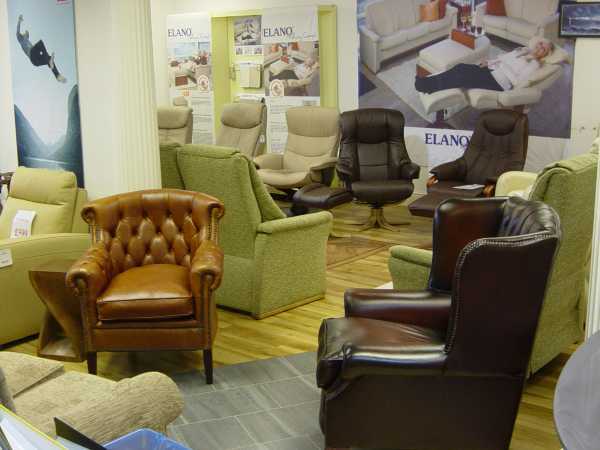 We stock many chairs for immediate delivery needs, and can make made to measure chairs in a full range fabrics, leather and contract materials. Having a big choice is important, especially with electric riser mobility recliners, to get the right seat dimensions for total comfort and support. 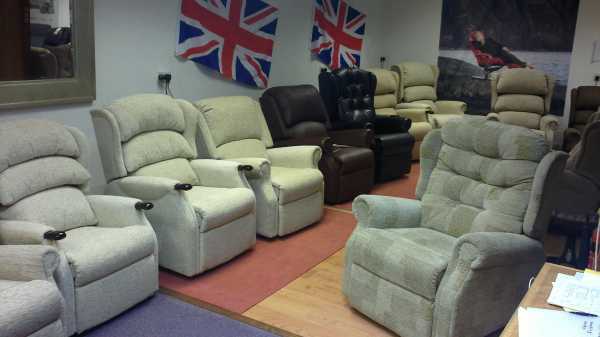 All riser recliner chairs in stock are available for immediate delivery. 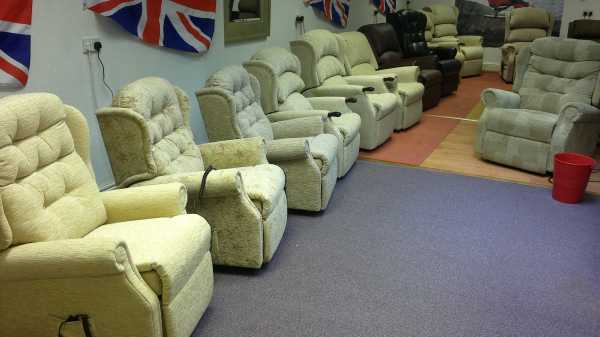 Over 25 rise recliner chairs to choose from. 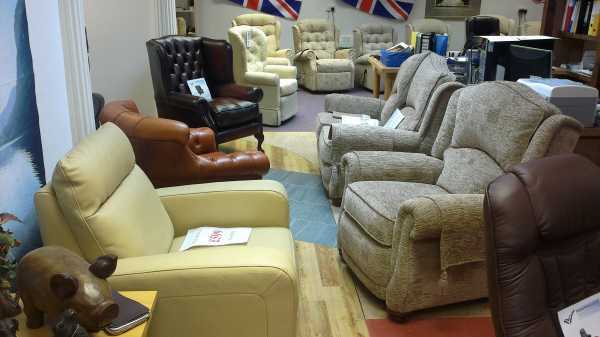 Good selection of traditional leather upholstery. 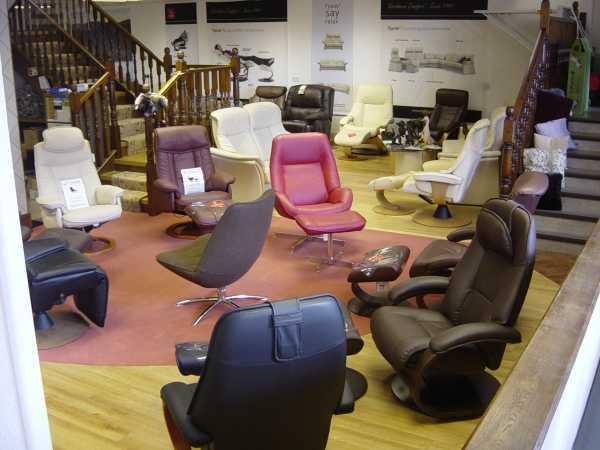 Fantastic range of leather Swivel chair and stool recliners from Fjords Hjellegjerde Elano Scansit Daneway and Kebe. 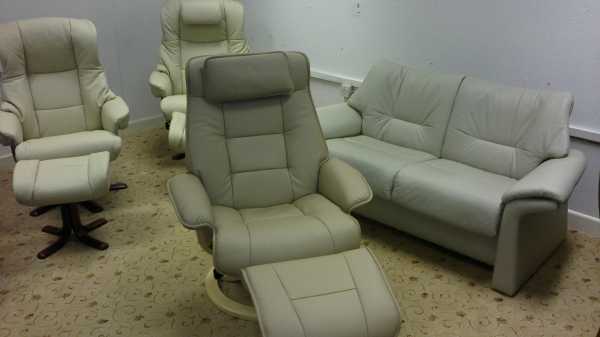 Massage Chairs with matching suites from Keyton. 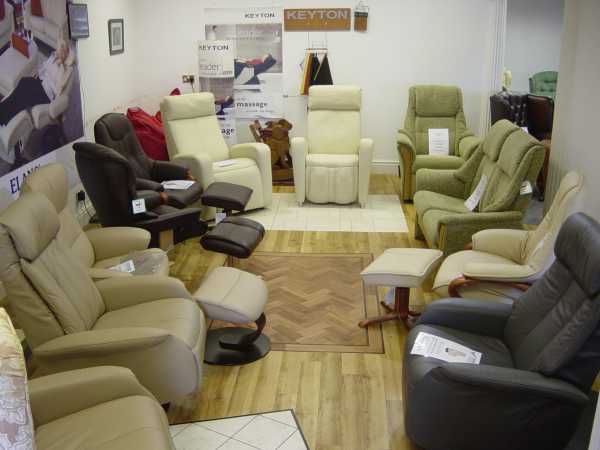 Selection of one off Clearance special offer recliner chairs. 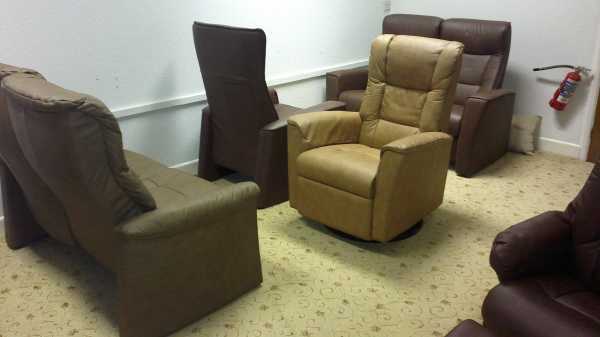 Matching swivel rocker recliners for the 2strs and swivel chair recliners. We have some of the best recliners in the world with comfort in mind. We don’t stock rubbish cheap inferior recliners!! We are a family husband and wife team who believe in giving the best customer service experience to all our clients. With us you will only be supplied with what you need, and no pressure selling techniques. We have had many repeat sales from our Customers to passing on the good experience to their friends, where ‘word of mouth’ gets round. Plenty of parking in front, on the main road, or on the side street (KING STREET). If you need mobility access, please feel free to park right outside the side entrance door or infront of the shop window as shown.